It is always a great thing to get confronted with new material on Eighth Tower Records, for this Italian label, part of the Unexplained Sounds Group family, did release some excellent stuff in the past. This time the release deals with a four-way partnership, which includes at least one project that I deeply adore – and now, after a couple of listens, that number did increase up to four! Polar Shadows is the working title for a split of four different projects from all over out dearest Mater Terra, which I will come back to immediately. The collection of ‘superspectrum sounds from ultraterrestrial dimensions’ (I am not making this up, yet it does sound teasing and attractive for sure, does it not!) is available via the label’s Bandcamp page for download (I am not sure whether there is a physical edition as well). It comes with cover artwork from an Indian polar station (which does fit perfectly to the Aural Art! ), and the result lasts for more than eighty minutes. The split starts with two compositions created by Weeping Glass, a project I did not know. I think (but I am not totally sure) that it is a new entity – yet that is of no importance. The first track, Bisk Orta, offers an aural expression of a desolate landscape of an empty space, claustrophobic and suffocative in essence. In a gloomy-cinematic way, it has sort of a Lovecraftian obscurity. Floating and long-stretched drones are the basement, but there is quite some additional material too; manipulated sounds, eerie synths, scratches, samples and field recordings from different angles. The unknown origins of many of these sonic manipulations adds an extra horrifying aspect for sure. Ikyraha Diskord, the second piece by Weeping Glass shows another aspect. Still there is that eerie atmosphere going on, yet from sonic point of view, this one contains much more experimental elements: sounds and samples, and besides details from Dark Ambient and Drone also quite some details from Musique Concrète, Electroacoustic and Dark Jazz. Next are Sun Through Eyelids, a project that I do follow passionately. This New Zealand-based act was formed four years ago by Tom Necklen to reflect ‘the healing aspects of nature, so that the music may also produce a healing element for many who appreciate the wonders of the unknown and the delicacy on nature’. They (also Meghan Wood collaborates – FYI: Megan’s main project, Crown Of Asteria, and Sun Through Eyelids released a split in Summer 2016, so there is more than a coincidental connection going on…) worked on several collabs and splits before (e.g. with mighty colleagues like DeepDark, Sebastian Crugley or Bleak Fiction), with this specific one as a new (or ‘another’) highlight in their career. The Dark Ambient is strongly atmospherical, transcendental and ethereal, but like usual, it is filled with so many hidden levels. The spine consists of different esoteric synth layers, but the subtle additional elements (field recordings, whispers and spoken words, strings, wind instruments and so on) show the superior identity of this act. Sun Through Eyelids are represented with three tracks on Polar Shadows, which are very closely related in an organic way, yet convincingly differing in the core as well. Ascetic Imprint indeed has something ascetic, with its lo-fi and dreamlike soundwaves, while A Polar Fortress exhales vast, frosty fields of ice and snow, where nothingness dwells. This specific piece contains some grandiose, yet quite scarifying excerpts, and the end of the composition offers the listener a magnificent dreamworld, Descent, the third piece, is a shorter one (3:37), balancing in between the void pictures of the first one, and the horrific atmosphere of A Polar Fortress. Like an astral journey into oblivion, or a travel into the dim psyche, this ‘song’ shows the excellence of Sun Through Eyelids’ ability to create wonderful ambient soundscapes. The Portuguese outfit Experiment#508 is a solo-project by André Quaresma, also known from Tabacaria. On Polar Shadows, Experiment#508 contributes with three compositions. There is a lot of experimentation going on right here, within this mixture of scuffing noises, haunting sound-collages and even psychotic stuff. I adore the slowly-pounding drum patterns in the lengthy (about ten minutes) track March For Our Lives, sounding like, indeed, a slow march, step by step coming closer to the end. In a way, it has something martial and, at the same time, ritualistic. Yet even more deeply ritual in its core is I Remember Flowers, being mesmerizing, meditative and transcendental. This slow piece of aural magnificence comes with an enormous arsenal on subtly injected elements, being confusing at once, and introspective at the same time. And Death Will Save Us All is the third composition by Experiment#508, which uses several natural sounds: rain and water, birds and beasts, wind and so on. The evolution, smooth and calm, sort of climbs up, revealing a next dimension behind the secret portal, like a night vision within empty chambers of a mental asylum. The two final tracks are written, composed and performed by A Bleeding Star, a mysterious entity from Ottawa, Canada, which were no stranger to me before. Nighthigh is, with its twenty+ minutes of length, the longest composition on this split, and it starts of quite confusing. Loops and feedback, scarifying melodies and bizarre sounds are mixed into an uncomfortable, and in a masochistic way an attractive, symbiosis of sonic frenzy. Misty and mystic, Nighthigh evolves, falls back, crawls back up again to progress, and continues exploring and experimenting. This heavy Drone Music contains that noisy approach, quite unique, quite sombre too, yet absolutely adventurous! Despite the lengthy progress, this piece permanently triggers, demonstrating many captious details and finicking additions. The second ‘song’ by A Bleeding Star, modestly entitled Chambers Fill’d With Possessed Royal Guests Obsessed By Matters Of Disloyal Bequest, has a comparable oppressing atmosphere, yet from sonic point of view, the experimentation goes even further: melancholic piano, electronic injections, captivating synth lines and deep-astral drones, it’s all part of the ingenious approach. In conclusion I cannot but promote this four-way split, for all projects involved teamed up to bring something provocative and attractive. 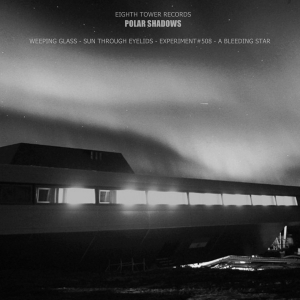 Polar Shadows collects ten differing yet closely related pieces of Aural Art that show the majestic face of the worldwide Drone / Dark Ambient / Noise scene. Nice!